This 192 page paperback book is the latest in the popular "Starting to Collect" series. 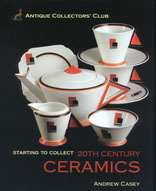 Ideal for the new collector, it provides easy to read information about the diverse range of products manufactured by the pottery industry across Europe and The United States during the 20th century. Fifty British manufacturers, one of which is Shelley Potteries, are included, together with twenty or so from elsewhere around the world. The wide range of collectibles available is discussed and many are illustrated in full colour. The book includes tips on caring for and displaying your treasures.